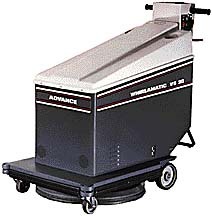 The NILFISK-ADVANCE WHIRLAMATIC UHSB20 is a battery buffer. The unit has a balanced ratio of weight to pad speed, which produces an above average shine. This unit features a dust-control system that traps dust in dual collection bags. The NILFISK-ADVANCE WHIRLAMATIC UHSB20 has easy-to-use controls at the operator's fingertips with twist grips that start the pad.